Accor – Newsroom | Fairmont Hotels & Resorts buzz across the United States with new Wild Bee Hotels. Fairmont Hotels & Resorts buzz across the United States with new Wild Bee Hotels. NEW YORK, June 8, 2016 – Wild mason bees, some of the most effective pollinators on earth, can now visit ten new luxurious bee hotels to rest their wings in the United States. These new oases were developed by Fairmont Hotels & Resorts in partnership with Pollinator Partnership to serve as habitat for nesting and reproduction. Habitat loss is a leading cause for the decline in wild bee populations, which are responsible for the pollination of one-third of the food produced in the U.S.
For more than a decade, through its Bee Sustainable initiative, which is part of the luxury hotel brand’s larger Fairmont Sustainability Partnership program, Fairmont has committed itself to improving the overall health and conservation of bee species globally, and has built 40 apiaries and pollinator bee hotels at properties around the world. The Fairmont bee hotels were built by engineers at participating locations across the U.S. in consultation with Pollinator Partnership, the largest not-for-profit organization dedicated exclusively to the protection and promotion of pollinators and their ecosystems. Designs incorporate reused materials and were inspired by the local surroundings. From a wine barrel bee hotel at the Fairmont Sonoma Mission Inn & Spa to a miniature version of the Fairmont Copley Plaza in Boston, to a beautiful design that features the Washington monument at the Fairmont in DC, the engineers spared no creativity when developing their concepts. 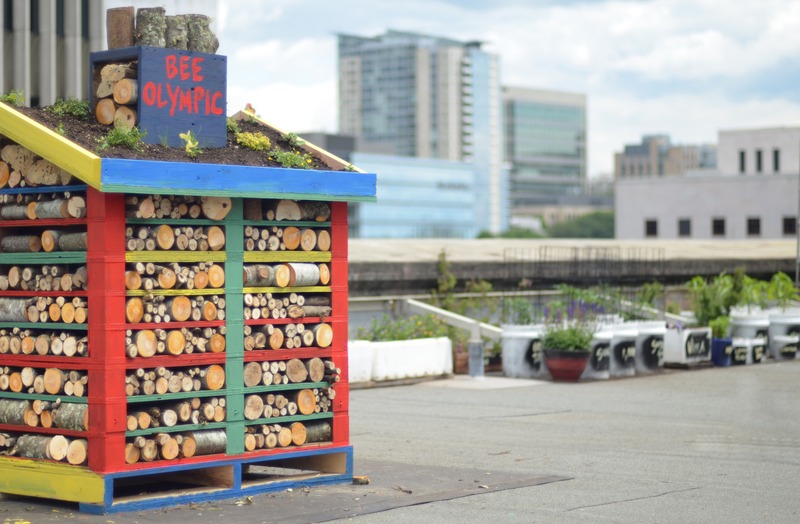 The bee hotel at The Plaza in New York is French inspired, like the hotel itself, and was developed in partnership with the Central Park Conservancy and Fairmont’s international Bee Sustainable partner, River of Flowers. “Often we hear people complain that they are afraid when they see a bee in the garden but the reality is that not seeing a bee in a garden is a much scarier proposition,” said Laurie Adams, executive director, Pollinator Partnership. “Bee visits are critical to most flowering plants, and vital to healthy ecosystems and agriculture. It is up to every one of us to do our share, right now, while the opportunity for the reversal of decline is still within our grasp. Installing bee hotels and planting pollinator friendly plants are very practical ways to take action now. We commend Fairmont for taking action on this very important issue. " Americans can easily select plants that will support local pollinators by entering their zip code in Pollinator Partnership’s eco-regional planting guide. A limited number of pre-made mini-bee hotels will be available for purchase at fairmontstore.com starting in mid-July. Guests can also build their own DIY bee hotel by following this simple step-by-step guide. New Fairmont bee hotel locations include The Plaza, A Fairmont Managed Hotel in New York, Fairmont Copley Plaza in Boston, Fairmont Washington D.C., Fairmont Dallas, Fairmont San Francisco, Fairmont Olympic in Seattle, Fairmont San Jose, Fairmont Newport Beach, Claremont Hotel & Spa, A Fairmont Managed Hotel, and Fairmont Sonoma Mission Inn and Spa. To raise further awareness about the importance of bees in American food systems, executive chefs at participating Fairmont Hotels & Resorts have developed special menu items with ingredients that rely on bees for pollination. A series of Bee Sustainable packages will also be available throughout the summer with participating hotels offering 10 per cent off the daily rate and a $50 dining credit per stay. Ten dollars from each stay will also be donated to Pollinator Partnership to support important bee research and programming. Research and development is currently underway with River of Flowers to build regionally relevant bee hotels in Dubai and Singapore, with more global locations forthcoming in the years ahead. For more information on Fairmont’s Bee Sustainable initiative and the importance of both honeybees and wild mason bees in the United States visit Fairmont.com/bees. The Pollinator Partnership (P2) is a 501(c)3 organization dedicated exclusively to the protection and promotion of pollinators and their ecosystems. Birds, bats, bees, butterflies, beetles, and other small mammals that pollinate plants are responsible for bringing us one out of every three bites of food. P2 works with farmers, beekeepers, scientists, governments and members of industry to promote actions and policy that benefit protect and promote pollinators. Without the actions of pollinators agricultural economies, our food supply, and surrounding landscapes would collapse. In 2016 P2 celebrates 20 years of action and advocacy for pollinators. Visit www.pollinator.org to learn more.